MIDDLEBURY, Vt. - The debate over fossil-fuel divestment took a spirited turn on the Middlebury College campus Tuesday evening as proponents and skeptics traded evidence and impassioned arguments for and against selling off endowment investments in the oil, coal and gas industries. 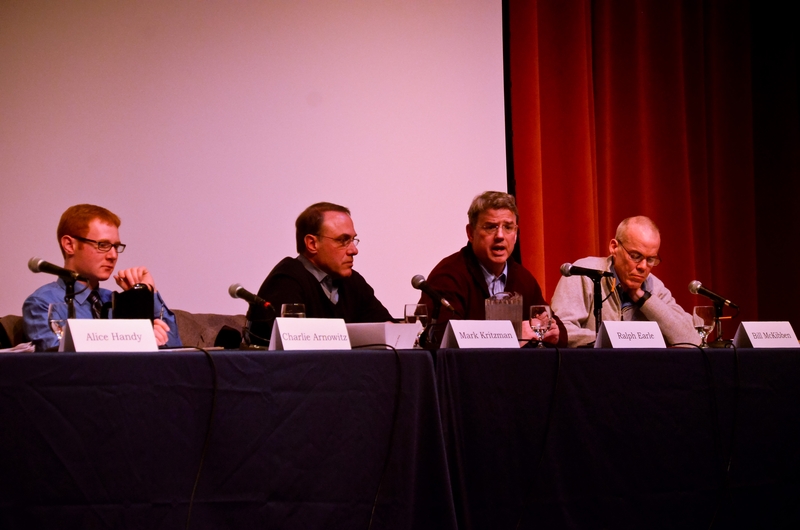 Nearly 300 community members filled McCullough Social Space Jan. 22 for the two-hour panel discussion that Middlebury President Ronald D. Liebowitz hopes will be the first in a series of events devoted to exploring the issue. The discussion, which started out with the tone of a somber tutorial, took on a sharper edge once Bill McKibben, Schumann Distinguished Scholar at Middlebury and one of the nation’s most prominent environmentalists and activists, took his turn. Addressing several previous panelists who had argued that divestment would come with significant economic costs or would be of limited effectiveness in changing corporate behaviors, McKibben framed the issue in moral terms while questioning the claim that so-called socially responsible investment policies necessarily lowered investment returns. A student questions panel members on divestment. A near-capacity crowd at McCullough Social Space. Middlebury President Ronald D. Liebowitz introduces the panel. Following his opening comments, President Liebowitz, who called divestment “a complex issue that cannot be reduced to slogans or sound bites,” introduced the event’s moderator, David Salem, 1978 Middlebury graduate. Salem, the former founding president and chief investment officer of The Investment Fund for Foundations, noted that the panel would not address the underlying issue of climate change itself, but would focus exclusively on the question of endowment management. Patrick Norton, vice president for finance and treasurer of the college, opened the discussion by explaining the importance of the endowment to the college’s finances, the role the board of trustees plays in determining how much of the endowment is spent each year, and why the day-to-day management of the endowment is delegated to a private investment management company, Investure. Investure President Alice Handy followed Norton and explained that her Charlottesville, Va.-based company invests the portfolios of six colleges and seven charitable foundations. “We will always try and do what’s best for Middlebury,” she said. “In practice, our clients pool their assets together into comingled funds managed by Investure, which have varying levels of liquidity. This allows all of our clients to have access to our very best ideas and so that we don’t have issues of favoring one over another.” She said that participating institutions also benefited from increased negotiating power, better terms and fee structures, increased savings in administrative fees, and reduced costs to clients for compliance, audits, legal fees and due diligence. Handy noted that not all of her firm’s clients “feel the same passion about all issues. Divestment, for example, would require a buy-in by all of our group.” That fact could pose a key stumbling block if Middlebury or any member of the Investure consortium were to decide to divest of fossil-fuel companies, she said. 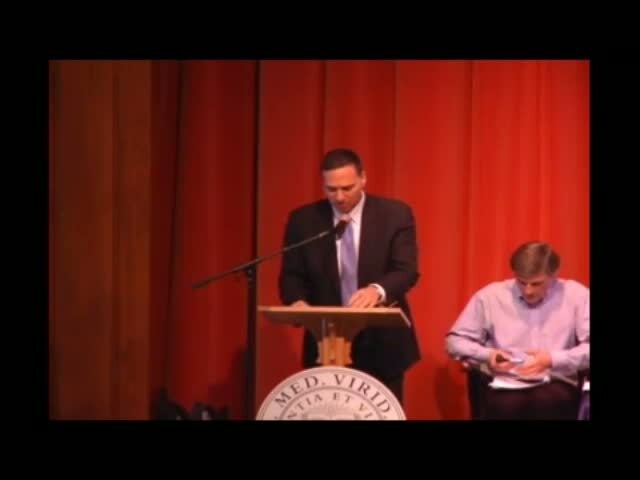 Arnowitz shared the results from a recent SGA survey of 1,031 Middlebury students. On the first question, 63 percent of respondents said the college should apply the principles of socially responsible investing to its endowment, 14 percent were opposed, and 23 percent had no opinion. On a second question seeking to prioritize socially responsible investing, 28 percent thought it was not particularly important, 32 percent thought it was somewhat important, and 40 percent thought it was very or extremely important. On a third question, the question of divestment itself, 38 percent of students supported divestment from both fossil-fuel companies and arms manufacturers, an additional 10 percent prioritized fossil fuels, and 12 percent prioritized arms manufacturers. “60 percent of the student body support some form of divestment,” Arnowitz said. Of the remaining 40 percent, 15 percent don’t support divestment and 25 percent have no opinion. Economist Mark Kritzman, an adjunct professor of economics at MIT, presented a detailed analysis called the “Monte Carlo simulation” to estimate the cost of socially responsible investing. For an institution with a $1 billion portfolio of 250 stocks selected from the Standard and Poor’s 500 list, Kritzman asserted that the cost of socially responsible investing would be $16.9 million after five years, $49.5 million after 10 years, or $211.3 million after 20 years. Using the same parameters but having the freedom to invest in any fund in the world, the cost would be $34.3 million after five years, $99.7 million after 10 years, or $420.5 million after 20 years. Using his data, Kritzman asked the audience to contemplate whether the true cost of divestment would be more effective if the institution took that $420.5 million dollars and invested it directly to effect the desired change, as opposed to withholding it from certain corporations. Ralph Earle, a former environmental affairs official in Massachusetts and today a renewables-focused venture investor, called climate change “the most critical issue of our time,” but said he doesn’t think divestment from fossil-fuel companies will have much impact. He based his opinion on the effectiveness of previous divestment drives and on the realization that divestment could, in effect, help three of the world’s largest oil companies, since they are not publicly traded. McKibben took exception to several of the positions taken by other panelists. He explained that his organization was not calling for immediate divestment, but rather a phased withdrawal over five years from a list of 200 companies. In response to a question, Handy said that roughly one percent of Middlebury’s endowment was invested in those 200 companies. The panel also took a number of questions from the audience, and as the discussion neared the two-hour mark, moderator David Salem called the evening to a close.